Presenter Ann Jones and shorebird expert Bai Qingquan on the spectacle of birds in the air and the deep feelings inspired by their migration. Thousands of calling shorebirds take to the air, forming a giant cloud which rolls across the sky. 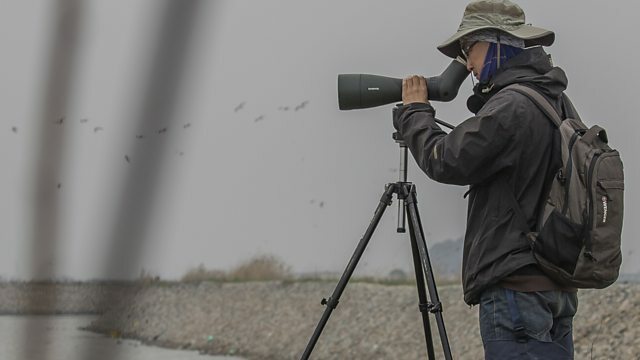 Ann Jones witnesses one of the two great avian spectacles to be seen still at Yalu Jiang Nature Reserve in northern China. Local shorebird expert Bai Qingquan talks about his emotions when he sees the other - birds beginning their long migratory flight to the Arctic to breed. How do perfumes get their scent? Why is it so difficult to clean the oceans of plastic?—Plastic Fantastic, How Much Plastic Can We Recycle?